The Minuteman Section of the Mercedes-Benz Club of America serves Mercedes-Benz enthusiasts from Massachusetts and Rhode Island.As a member of the club you will enjoy an array of benefits and enjoy the many Minuteman Section functions and social activities fostering friendship and sharing of our common passion for the Mercedes-Benz automobile. We encourage you to take advantage of the many benefits of the club and join us as an active participant in its many automotive and social gatherings. Did You Know?Your membership with the Mercedes-Benz Club of America (MBCA) comes with special privileges, like saving $500 off the purchase price of a NEW Airstream Autobahn® or Airstream Interstate®, both built on the award-winning Mercedes-Benz Sprinter chassis. To qualify, you must be a current Member of the MBCA. Learn about the MBCA Member's Loyalty Rewards Program and how you can save money off an upcoming MBCA automobile purchase. Register to receive updates to Minuteman Section events and events from other enthusiasts clubs opened to Minuteman Section members by special invitation. 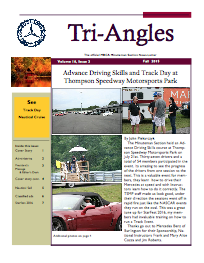 You will also receive occasional technical articles and a full color version of our Minuteman Section newsletter, Triangles, as it is published quarterly. Your Privacy Is Important - Lists Are NOT Shared. Click to see all upcoming events! StarFest 2016 Was a Great Success! After two years of planning, StarFest 2016 was held the first week of August. Three hundred and seventeen Members from as far away as WA, AZ, NM, CA and Canada enjoyed the events which included Track, Concours, Ken Bourque's Nautical Cruises and Court Brannen's Rallye. It was an action packed 4 days that had everyone tired but happy at the end. I want to thank all the Members of the Minuteman Section who worked hard to make StarFest 2016 an outstanding event. Without you it would never have been as successful an event. View and purchase pictures from the event: Clarus Studios - official photographer of StarFest 2016. Not a MBCA Member? Join Today! Do you own a Mercedes-Benz, yet and haven't joined the Mercedes-Benz Club of America (MBCA)? Take a moment to explore the many benefits of becoming a member. Learn more about the MBCA National organization. MBCAEF encourages driver safety and is currently involved with the Tire Rack Street Survival program; a successful program designed to save lives - teen lives - through driving education. Instructional Driving Videos. While on Facebook, visit the Minuteman Section page.